The Gullah have always found self-sufficiency in the sea and what they could grow on the land. But when she was growing up, Sara Reynolds Green disliked working in the family garden. She has since turned that same garden into an organic community farm where she teaches self-sufficiency and sustainability to a generation of Gullah youth. Mrs. Green winnowing her rice. 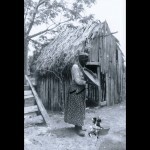 Rice, corn and sweet potatoes were historically the three most important sources of starch in the Gullah diet. Rice was the most important lowcountry crop, serving as the primary commodity for plantation production (more important than cotton). 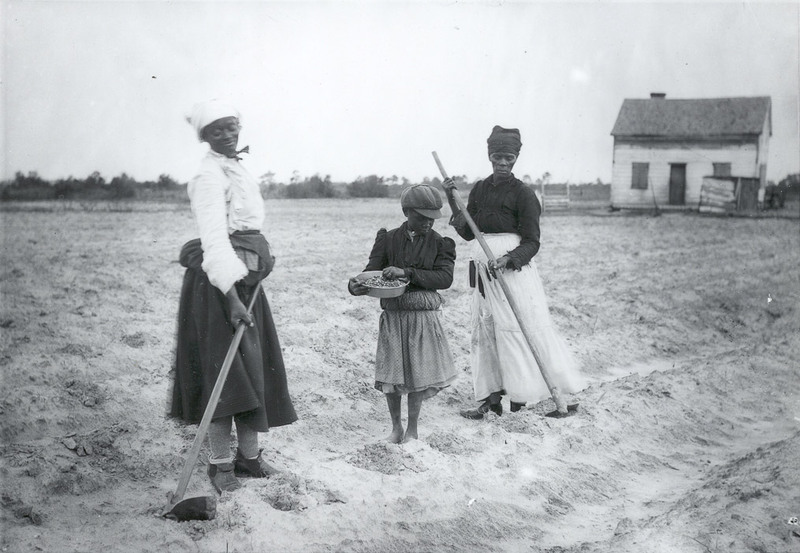 While rice is not listed in the slave diet before emancipation (it was likely too valuable a crop), it became an importation part of the Gullah diet. In this photo taken around 1907, Mrs. Green is throwing rice from a basket so that the chaff, or the lighter husks of the rice can be removed from the grains of rice. The heavier grains of rice fall in the basket below. Photo 0933a in the Penn School Papers #3615, Southern Historical Collection, Wilson Library, University of North Carolina at Chapel Hill. 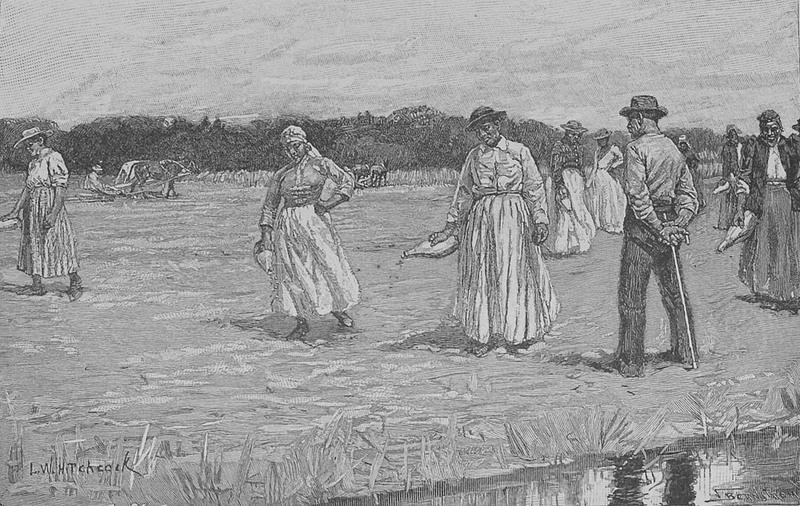 Rice planting, South Carolina, 1890s. 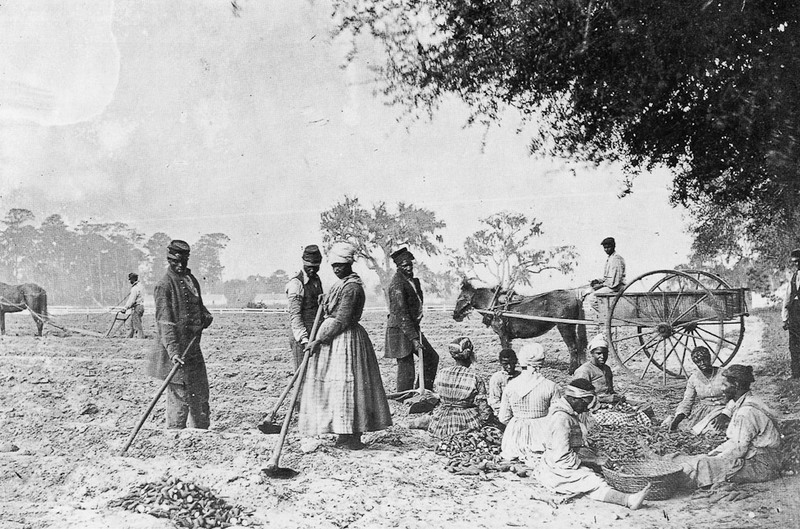 After emancipation, planters were reliant on wage farm workers to plant their commodity crops of rice and cotton. 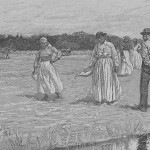 This view of farm workers planting rice in the 1890's is not that different from the process of planting during slavery. Women are using bottle gourds to spread the seeds on the flat rice fields. Ralph, Julian, 1896. Dixie; or Southern Scenes and Sketches (New York) p. 273; Image Ralph02, www.slavery images.org, Virginia Foundation for the Humanities and the University of Virginia Library. 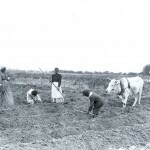 Peggy Mack and her family planting corn by the old method. 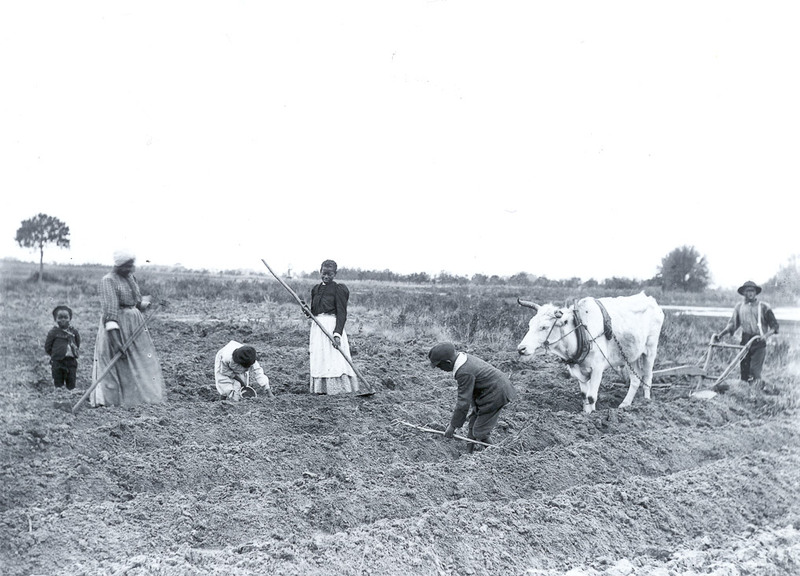 Taken after freedom, and showing a family planting their own land on St. Helena, this method of planting corn in hills on raised beds was also used on the plantations during the period of slavery. Photo 0941a in the Penn School Papers #3615, Southern Historical Collection, Wilson Library, University of North Carolina at Chapel Hill. Prophe Wyne and his family plant corn on the family farm. 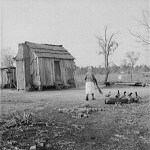 As a staple of the traditional Gullah diet, corn was grown as both food and commodity crop for sale. The photograph shows the traditional method of planting corn in hills, and the use of an ox-drawn plow to make the furrows. The entire family is engaged in the planting work. Photo 0955b in the Penn School Papers #3615, Southern Historical Collection, Wilson Library, University of North Carolina at Chapel Hill. This engraving from Robert Criswell's novel "Uncle Tom's Cabin" contrasted with Buckingham Hall, portrays a "corn-shucking" or husking. While it is a pro-slavery novel, and tends to depict slavery as a benign institution, there is some truth to the practice depicted here. The text describes the husking: " That evening the "corn-shucking" or husking, came off. The corn was piled in large heaps before the row of cabins,.... Around the large corn heaps were seated over two hundred men and women, (many of whom were from the neighboring plantations,) tearing off the husks and throwing the ears into separate piles; and in the midst of their employment all were chattering, laughing, singing and telling stories.... On the top of one of the heaps was mounted uncle Cato .... He was noted for his talent of improvisation. He would sing one or more lines of a song and the chorus would be repeated by all the others." 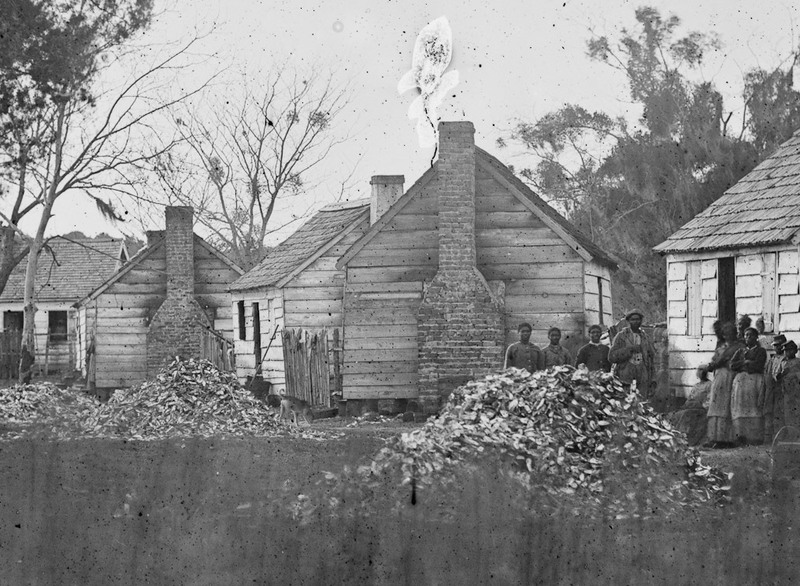 Slave quarters, Port Royal, South Carolina, 1862. This photograph shows a pile of refuse by the cabins similar to the previous engraving â although these are a mix of corn husks and oyster shells. 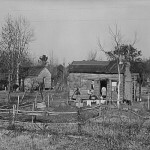 These piles could be burned for fertilizer for the fields, and show the importance of both oysters and corn in the Gullah diet at the end of the Civil War. 00806u (LC-B811-211A), Civil War Photograph Collection, Library of Congress Prints and Photographs Division. 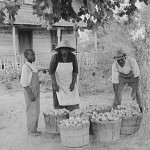 Sweet potatoes were and continue to be an important food staple for the Gullah. Yams and sweet potatoes are two distinctly different plants, although the roots they produce are similar. Yams are native to Africa, and were a staple crop in Nigeria and other homelands of the slaves brought to the low country. Sweet potatoes are a Central and South American native, and were brought to Europe by early explorers. The roots in the photo are probably sweet potatoes - they were easy to store over the winter and provided a good source of vitamins, particularly Vitamin A. 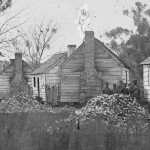 Image NW0151, www.slavery images.org, Virginia Foundation for the Humanities and the University of Virginia Library. The fenced area in the yard of this home, has mounds of earth. These were the traditional method of preserving sweet potatoes over the winter. The pile of sweet potatoes would be covered with corn stalks, and then a layer of earth to insulate them from cold temperatures. fas 8c09544 (LC-USF34-050509-D), Library of Congress, Prints and Photographs Division. 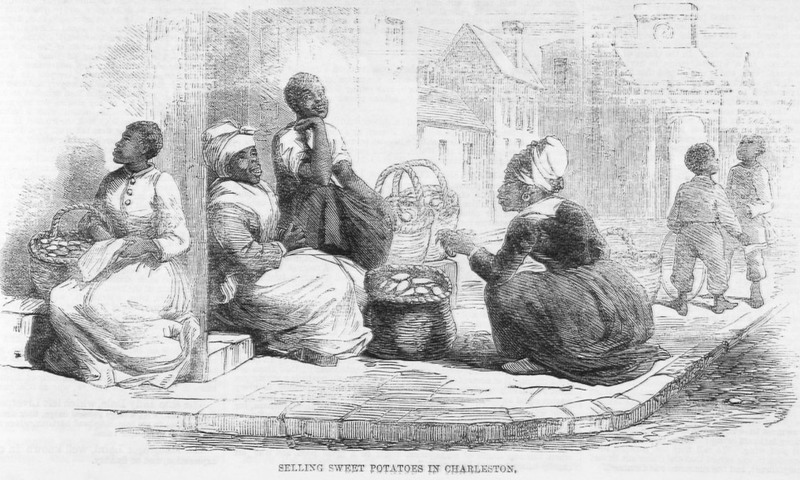 Selling sweet potatoes in Charleston, 1861. 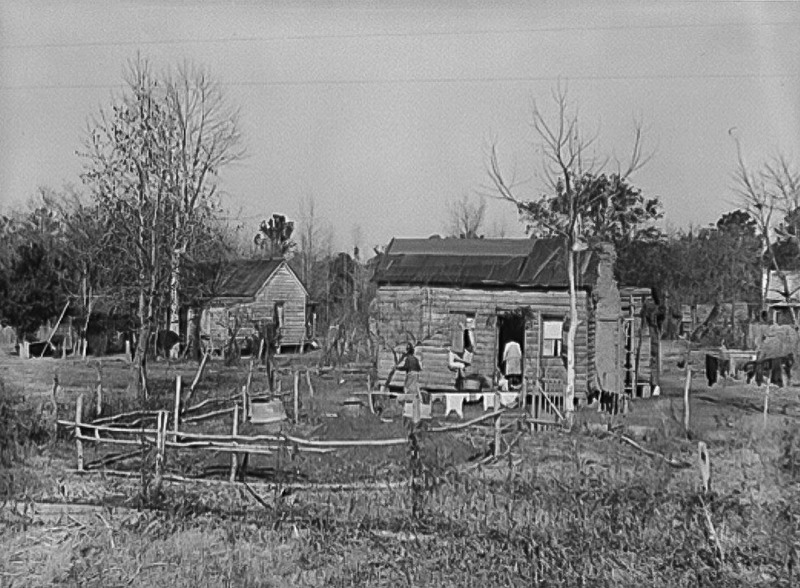 During the plantation period in the Low Country, slaves worked on the task system. That allowed them the time to engage in their own endeavors: fishing or planting land of their own. 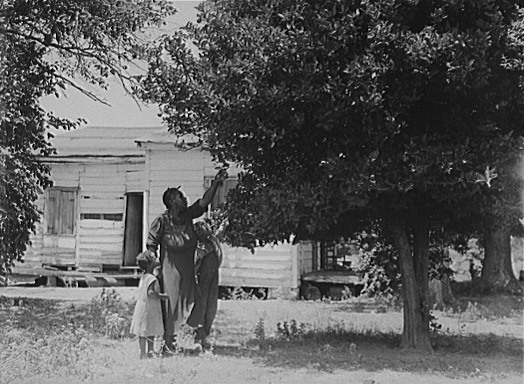 It was common practice to give each family about a half an acre of land to cultivate. 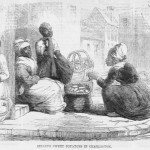 The produce could be bartered or sold to the plantation owner or in the larger centers as depicted in this engraving, published in the Illustrated London News, February 2, 1861. 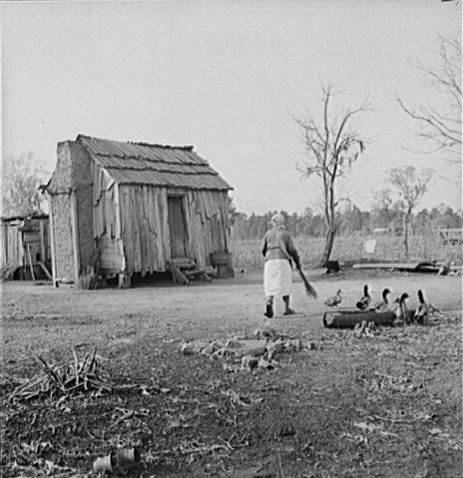 After slavery, much of the food produced by Gullah families was for self-sufficiency. Families had ducks, pigs and other livestock, along with family gardens. fsa 8c30071 (LC-USF34-050784-E), Library of Congress, Prints and Photographs Division. Mrs. Brown and children, St. Helena Island, 1939. 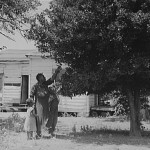 Subsistence agriculture on St. Helena included oranges grown by this family. fsa 8c10442, (LC-USF34-051960-D), Library of Congress, Prints and Photographs Division. 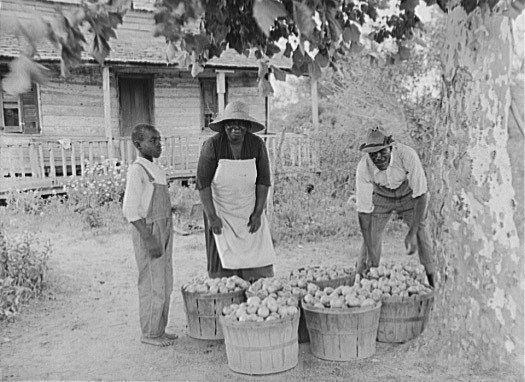 Tomato harvest, in the area of St. Helena Island, 1936. During the 1930's and 40's people grew and sold a variety of fresh produce to markets off the island. Tomatoes continue to be an important crop on St. Helena Island today. 8b29054u (LC-USF43-006797-D) Library of Congress, Prints and Photographs Division.